I have made quite a few hats from this pattern—just the simple one. I have made neck warmers, too, but I didn't use the pattern as that is a simple tube. I first made the hat and neck warmer in a gray fleece. I even made two of those hats; still, I lost them all. Then I got this cool camo fleece in a purple colorway. I love it, but the only things I have thought of to make so far (that I would actually wear) are this hat and neck warmer. I made a bunch in case I lose them again. 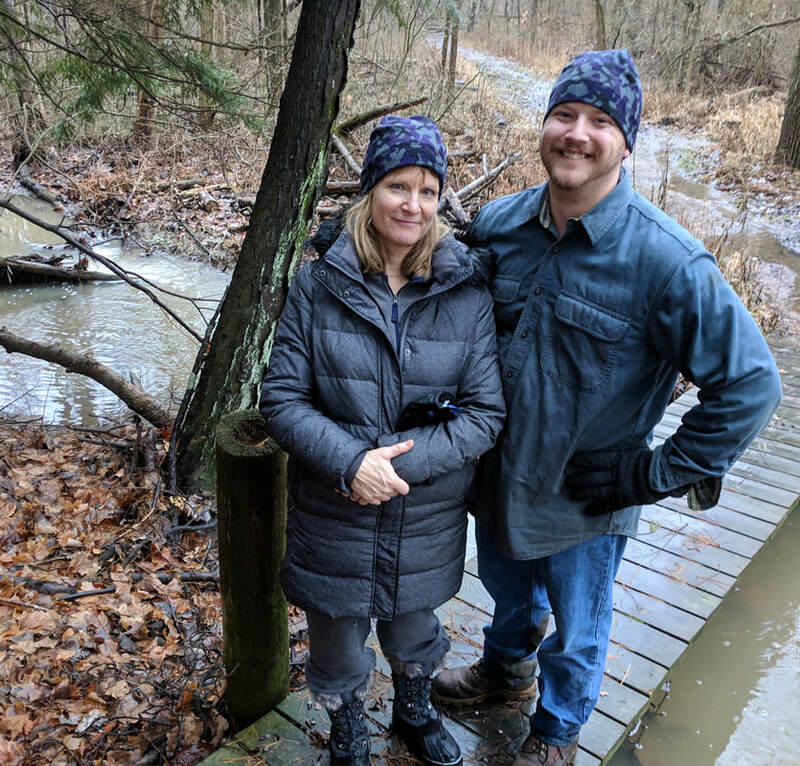 On a recent hike with my son and husband, we each wore one. 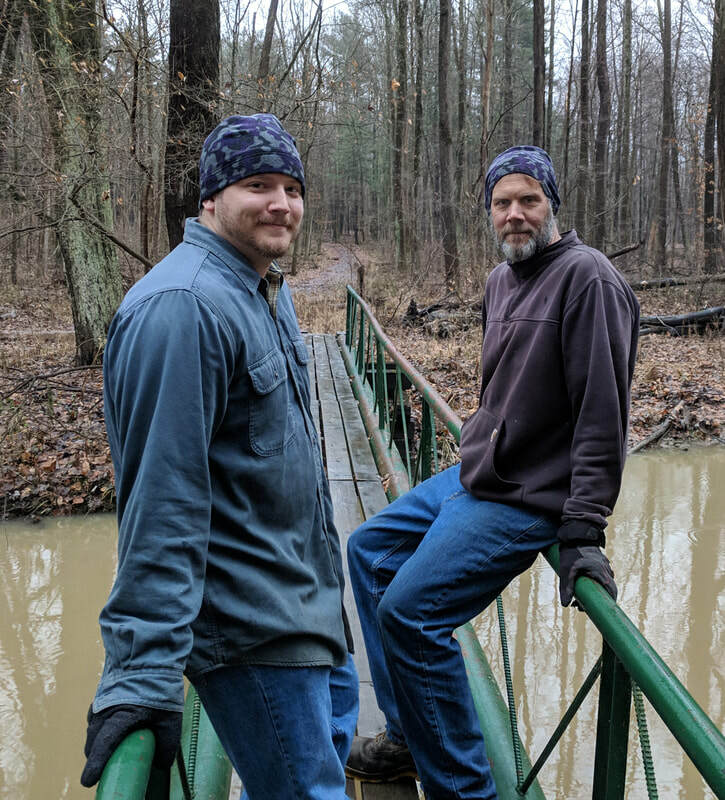 Actually, now that I am thinking about it, that is one hat on me, one hat on my son, and one neck warmer on the tough guy who didn't need to bring proper clothes for a winter hike. Fortunately, I had spare gear. 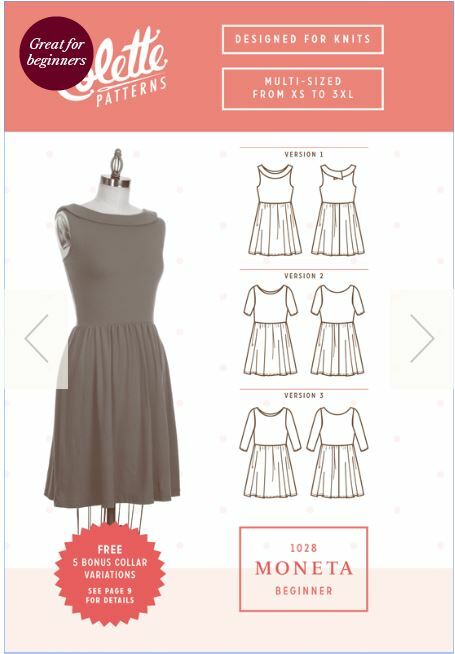 This is a dress I had seen in an ad. I knew I could make that just as easily as I could order it (which never turns out to be true in the end, of course), so I snipped it and put it on my list of 2018 projects. 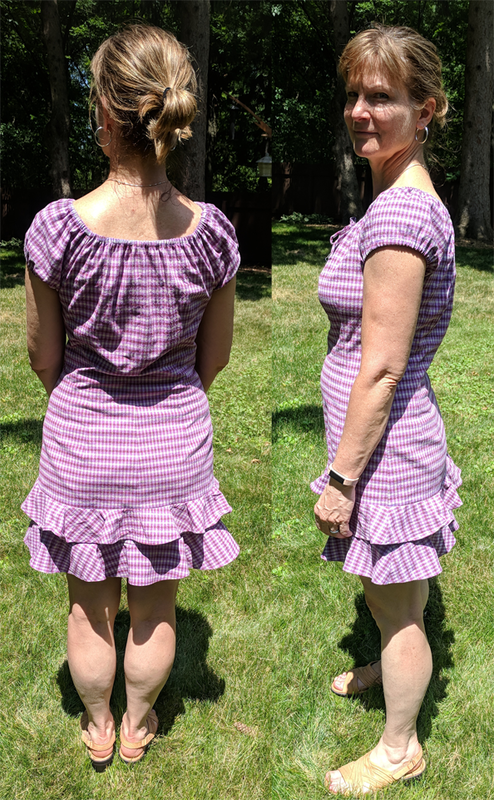 I had plenty of this fabric left, and I was worried that since I had NOT intended to make the dress from the outset, I might be forced into making frustrating adjustments or compromises for what I had in mind. Since my daughter liked the pullover, I gave it to her and started over. I ended up with something I am pretty happy with! I searched online and finally found a knit in the pattern I wanted at Cali Fabrics. I really like this company. 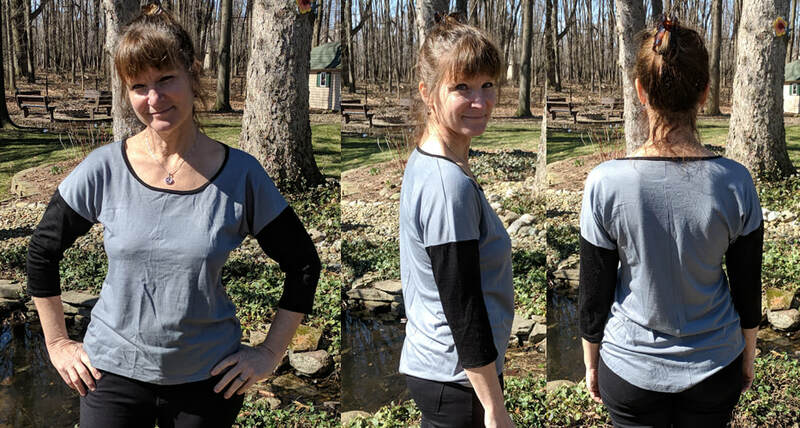 This fabric is a brushed poly and it is as comfortable and easy to sew as advertised. I am super happy with the fabric and feel lucky to have found the plaid I was looking for. Also, I am 5'4" and I needed to remove 4 inches from the body of the cardigan before attaching the band. I could have cut the arm length down as well before attaching the cuffs, but I like the extra length at my wrists. I made this all on my serger and coverstitch and it sewed up very easily. Still in search of the perfect cowl pattern, I made McCall's 6963 in a magenta (?) wool jersey. I like it; it's super comfortable, it's warm, and the color suits me. So I think the top is fine for wearing under a blazer or sweater, which is what I do anyway. But I am not 100% happy. 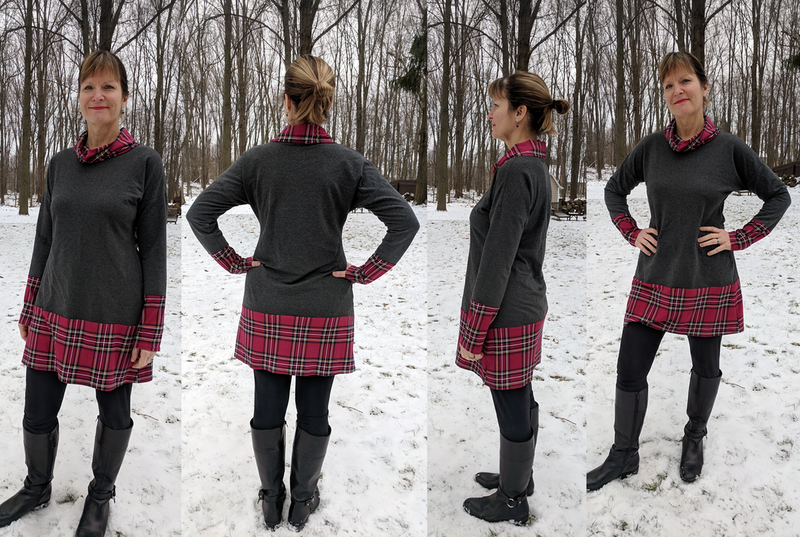 The biggest problem I have had with cowl patterns is that the there is not enough shoulder—the garment always ends up showing my bra straps, which incenses me. There seems to be just enough shoulder on this top, but I don't think the cowl looks that good. Maybe a cowl doesn't suit my figure like I thought it did??? To ensure I would have enough garment at the shoulders, I made a smaller size to fit my underbust (10) and made a full bust adjustment. When I stand differently, you can see the weirdness more accurately. Eeewww. Don't like that cowl shape. Bottom line is I am still in search of my cowl Nirvana. I guess I will use this pattern if I desperately need a cowl for something in the meantime. I have wanted to make this pattern for a long time. It is on my list of 2018 sewing goals. 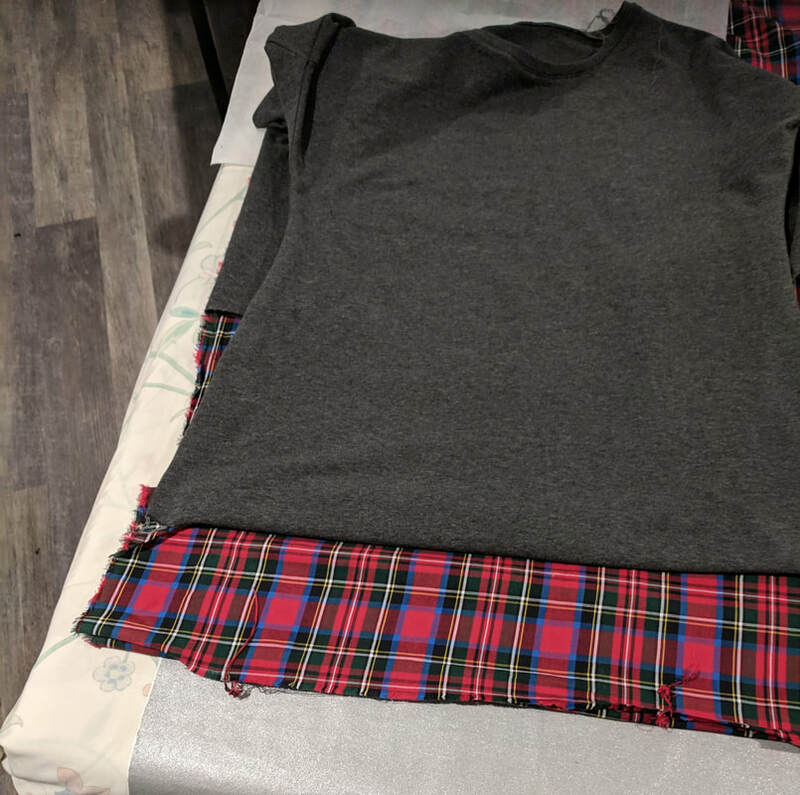 About 6 months ago I bought a few inexpensive "shirt" fabrics. I decided to use one and sew this up. So, it seems like it should be good, right? It looks like it fits very nicely. Unfortunately, there are 3 issues with this make. First, the fabric is heavier than I imagined. Plus it has some lycra in it. That was not so bad in one respect as it saved me from putting in a zipper. Which maybe I should have done one anyway, but I didn't have one and I was in the sewing zone and didn't want to get distracted. But the feel of the fabric with the weight and the lycra is too heavy. Something about the gathering of the shoulders is uncomfortable. I am very touchy I guess. The other thing is that don't you think I'm a little too old for this dress? That is how I feel. 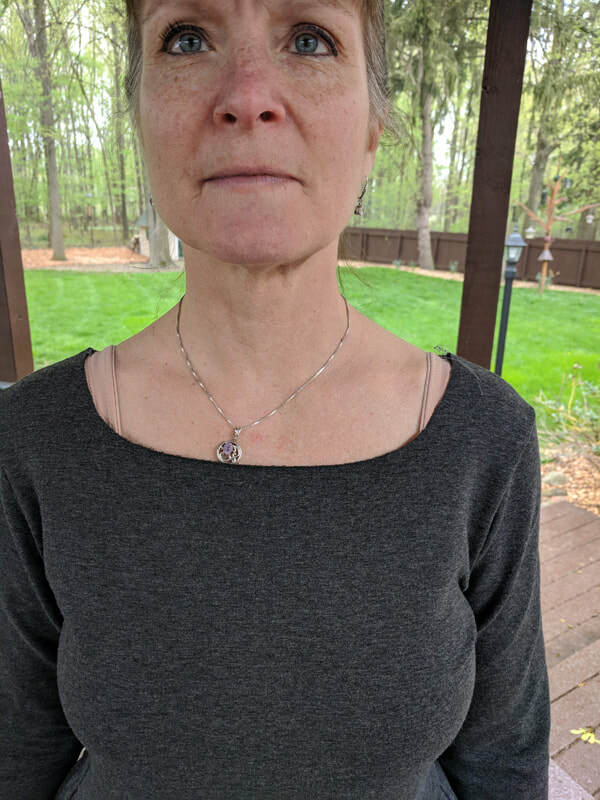 I did solve the problem by opening up the neckline, taking in the sides of the center seam 2 inches at the neck and tapering down to nothing an inch or so above the waist, and then sewing the neckline back up. It looks better now...but the other two problems aren't going away. 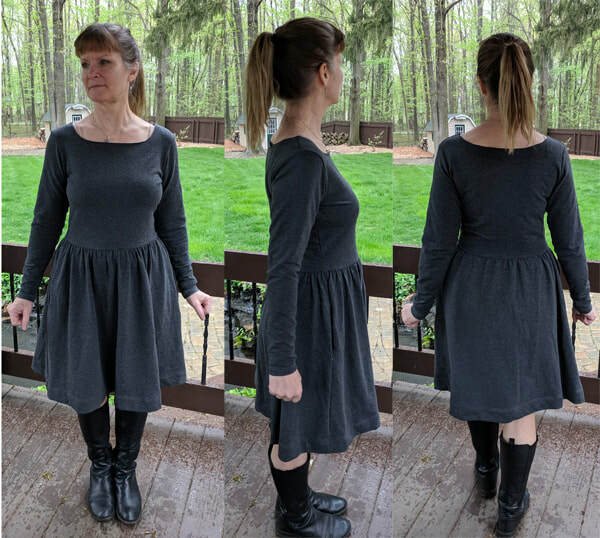 I will try this dress again in a more drapey, lightweight fabric and see if it helps. I needed a cover-up for a wedding I was attending in Seattle. My nephew was getting married in an outdoor setting (which turned out to be beautiful) and then holding the reception in a restaurant on the water (also beautiful). 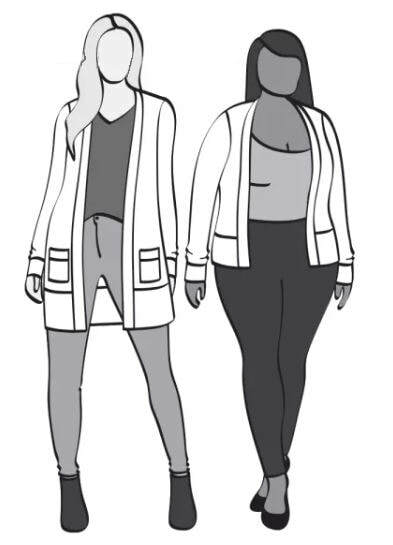 But they couple said "cocktail attire," which is not a concept I have any experience with. 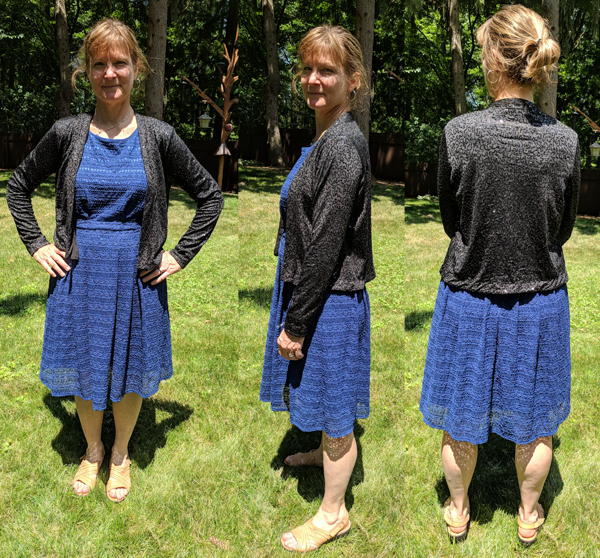 Googling around the Internets and asking a coworker led me to the conclusion that a sleeveless stretch lace cotton dress I already owned would work just fine, but I needed shoes and a cover-up to go along since the reception would be indoors and thus air-conditioned and cold, which I could not handle. I found some silver low-heeled sandals online, perfect for the occasion although surely never to be worn again, so I bought them (oops, but did not model them in the picture below). 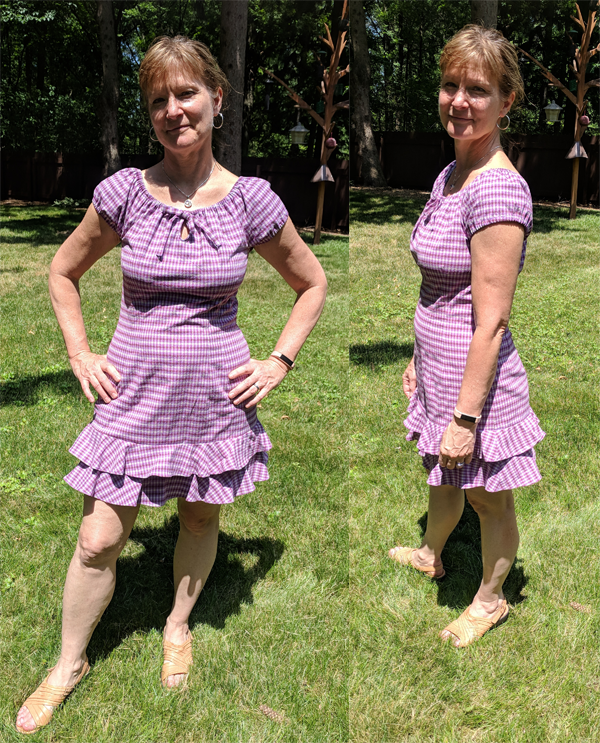 Now the fabric was very different, but the DRESS was nearly identical to mine and so I was swayed to at least make a muslin. It was hideous. I made view C. It wouldn't stay seated on my shoulders and flopped around in a shapeless habit. So I went searching for a new pattern. I wanted close-fitting sleeves and a simple but not shapeless body. I had wanted Blackwood anyway for some sweaters, but I hadn't bought it yet as I am trying to be good about buying anything until my fabric stash is reduced in volume and the patterns already purchased have been opened and tried. 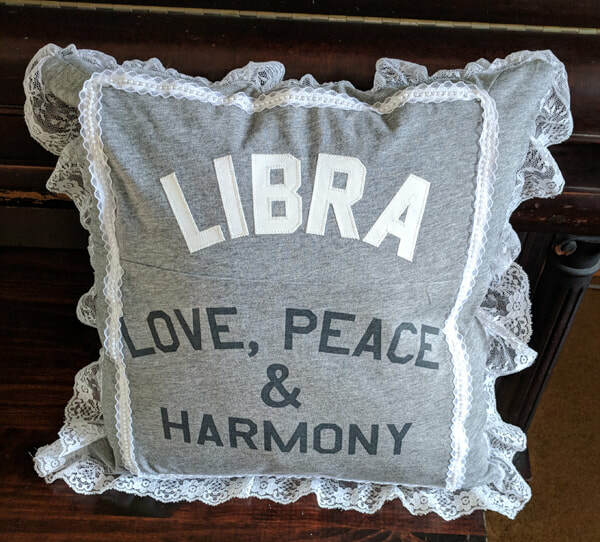 But as I was in need of a pattern for a specific project and an actual occasion, I was absolved of any responsibility or guilt and I went ahead and bought it. There was no time by this point to make a muslin. I made the shorter version but without the band. It turned out to be exactly what I wanted. It was comfortable and did the trick. It dressed up my outfit and I certainly felt I was in cocktail attire. The sequins on the sleeves did stick to those on the body on occasion, but it was not too bad. It kept me warm! I will definitely use the Blackwood for a sweater. I see the bottom hem is a mess. Oh well. This will probably join the silver sandals as a one-time wear. If I do have occasion to wear it again, I will revisit the hem. There are 25 million successful Monetas on the Internets. Mine is not one of them. I'm not even going to finish the neckline. I'm going to take it apart and reuse the fabric if I can. It's a knit bamboo, and a little heavy. The fabric feels nice on. But maybe the fabric's heaviness is why this dress is a disaster. 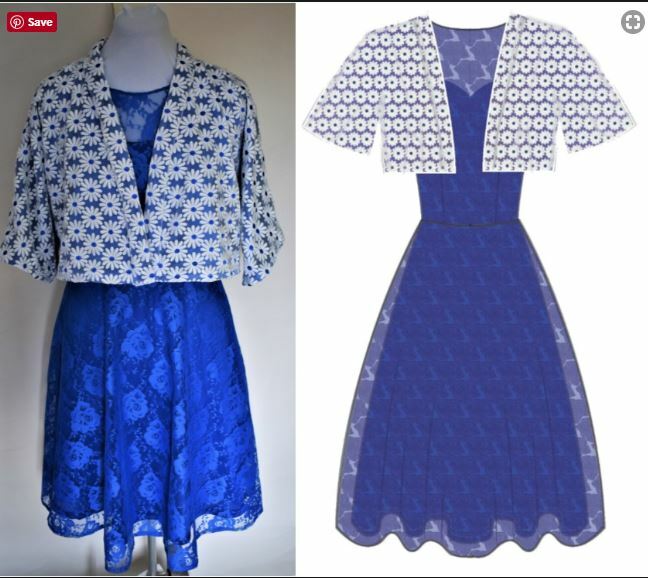 Or maybe Moneta is a style that just does not suit me. Maybe 20 extra pounds don't suit me. Here are some things that are wrong with this big disappointment. The waistline is too low by 2 inches. Maybe the heavy skirt is pulling the bodice down. The skirt poofs out at my hips. I detest how this looks. I used clear elastic to gather the skirt as per the instructions and serged the skirt and bodice together. I suspected I would not like this idea but I tried it anyway. The elastic has too much heft and stiffness to be right at the waist (or 2 inches below). I don't like hefty stiff things around my waist. The neckline is too big. WTF? You're supposed to turn it down 3/8 inch, so it would be even bigger. 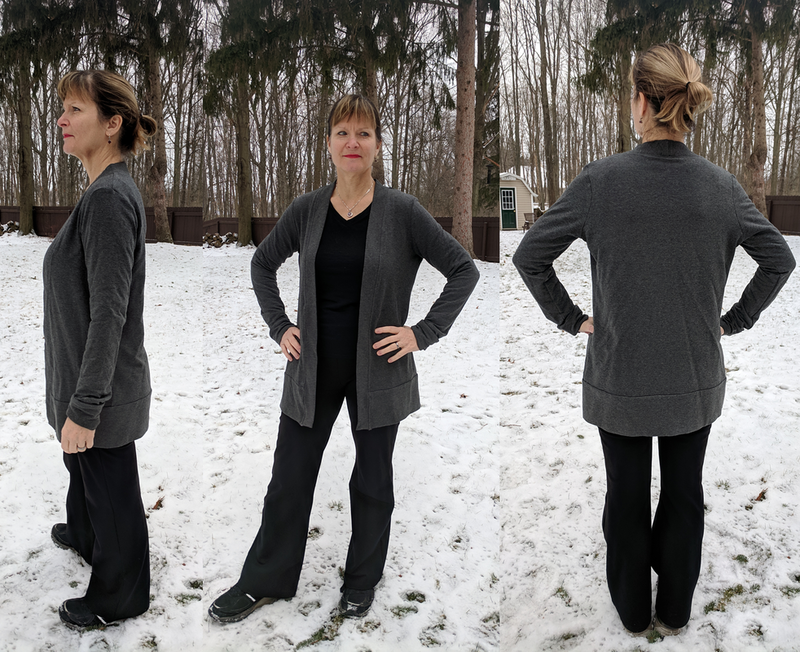 When I pull up the shoulders a couple inches, the waist is at my waistline and the neckline is acceptable. Maybe I have a short torso from waist to shoulders. This is not the first time I've had problems fitting a bodice. But jeez, a simple little knit thing? Why is this so hard? I raised the shoulders 1.5 inches. When I make this again in another fabric, I will use this variation. I'm still not sure this dress will look good on my bod. I am hoping it is just that this fabric does not suit this pattern. My sister bought a shirt for her daughter. She thought it reflected her perfectly. But the store only had size that was too small. So my sister asked me to make it into a pillow. 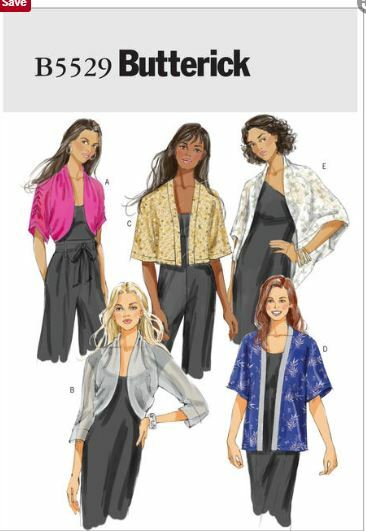 I'm frustrated with trying to find a good pattern for a top with a draped cowl neckline. I have a couple, one in particular, store-bought shirt that is perfect. I could use about 10 of those for work in different colors and prints. But I haven't found a good pattern yet. 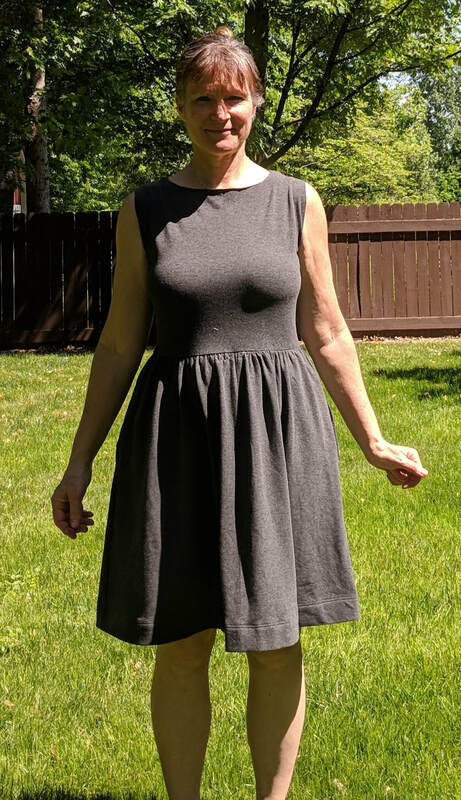 I have had Simplicity 1716 in my stash for a while (like about 100 other patterns I've yet to sew). I have pulled it out, studied it, been dissuaded by the unsophisticated way it falls from the shoulders in the envelope image, and put it back in the drawer a number of times. I finally decided to use it after discovering some white jersey in my stash. I was overcome with the desire to make a white cowl and resolved not to use New Look 6901 ever again, and desperate for a pattern in my own possession that I could use. Looking at some reviews on Pattern Review and thinking the results people got looked good, I went forward. Results: Meh. I wore this to work under a sweater (and over an undershirt because the white jersey is transparent), and it was okay. But there is too much foldiness. I accidentally cut out view F, which has extra fabric for ruching at the hips, so those extra folds don't help. But there are pleats with this pattern at the shoulders and at the bust to produce even more folds. The ones at the shoulders are acceptable, but the one at the bust is kind of weird, not because of the fold it produces but because of the pleat that sits at the side of the bust. Seems a dart would be more flattering. At any rate, I can't see myself making this one again, although I will wear this top until I can manage to replace it with one I like better. I had some gray and black wool jersey left over from other projects. I made this in a size T and graded out to the hips a little. 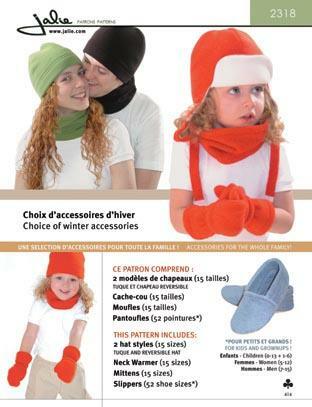 It was very simple to assemble, minus the neckband. Is this really the best way to affix a neckband? I must figure out how to use that coverstitch machine! I can coverstitch hems, but I haven't figured out bands yet. I like how the shirt turned out, but there are some aspects of it that make me doubt whether it is a good style on me. First off, the neckline is a little too large for my comfort. The sleeves...I am not a big fan of 3/4 sleeves. I don't find them comfortable. or warm, like the neckline. It's a great T-shirt look, but it doesn't work so well as a work shirt because the front is not too shaped. The two-toned design is lost under a sweater or jacket, which is essential office wear. Offices are always cold. I think the cover shows the best use of this dolman design. I should either make a loose sweater or use a print in the middle if I do this again. I think I will for a pullover sweater.